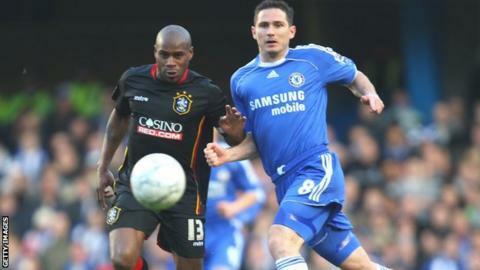 Former Chelsea and Leicester defender Frank Sinclair says he is happy to just fully focus on playing again while he mulls over his next management move. The 43-year resigned as boss of Colwyn Bay last week and is playing for Conference North rivals Brackley Town. The move came about when Sinclair, who also played in Tuesday's 1-1 draw with North Ferriby United, was contacted by Brackley boss Jon Brady. "I didn't take him seriously so I rang him and he was very serious," said Sinclair. "They have a few injuries and suspensions so he wanted me to help out. "I haven't been playing that regularly but have kept myself fit and I know I can do a job and help the young lads. "It's an opportunity to forget managing and coaching. "There is a chance to coach at the youth set-up with a League club. And it will probably do me some good as I will have time to reflect." Frank Sinclair made his Blues debut as a left-back in a 3-3 draw against Luton Town in 1990. He was part of the Chelsea team beaten 4-0 by Manchester United in the 1994 FA Cup final, but returned to Wembley as part of the side that beat Middlesbrough in the 1997 final. His scored in the 2-0 League Cup final win over Middlesbrough in 1998 - his last Chelsea game. The Jamaica international played in the 1998 World Cup and also won the 2000 League Cup with Leicester City. Sinclair said he "loved" his 22-month spell with Colwyn Bay but felt it was best to move on. He added: "The last couple of months have been very stressful and I wanted to give the club an opportunity to get someone with different connections and ideas. "It didn't go well and it wasn't just down to form. Vital players were out with injuries and we had to play some reserves. "Everybody knows we have been punching above our weight to finish 12th last season and that was very satisfying. "I had a good group but we became victims of our own success. The team was blown apart. Lots moved on because they are good players and other clubs picked up on that so the backbone of the team was lost. "This season we had lots of injuries and couldn't cope. "I wanted to leave when we were still 15th. When the best players return, it's very doable to finish in the top 10. "But I gained so much experience and could not have worked for better people. There are things I would do differently but I thoroughly enjoyed it."